Two Dead After Shooting Near Empire State Building : The Two-Way The incident outside the landmark building ended with the gunman's death. Nine other people were injured, according to Mayor Michael Bloomberg. A shooting near the iconic Empire State Building this morning has left two people dead — one of them the gunman who first opened fire — and has shut down streets around that Manhattan landmark. Police do not believe there's any link to terrorism. Instead, they suspect the gunman had some sort of work-related grievance. The man, identified by police as a 53-year-old, opened fire with a handgun around 9 a.m. ET. He killed a former co-worker, according to Mayor Michael Bloomberg, and then walked away from the street scene. Soon after that the gunman, said to be named Jeffrey Johnson, was shot dead by police after he fired on the officers, according to Bloomberg. Authorities say nine other people were injured. None are thought to have life-threatening injuries. Some may have been wounded by shots that police fired, according to Bloomberg. We'll keep an eye and update as warranted. -- Our colleagues at WNYC. -- The New York Times' City Room blog. Update at 11:45 a.m. ET. Here's What We Know So Far, And We'll Pass The Story Back To WNYC. "New York City officials say a laid-off women's accessories designer shot and killed a co-worker outside the Empire State Building, then got in a shootout with police. Jeffrey Johnson, 53, opened fire with a .45-caliber pistol at about 9 a.m. Friday on the Fifth Avenue side of the building. He was shot dead by police. "Nine others were hit by gunfire. Mayor Michael Bloomberg said that some of the victims may have been hit by police bullets. The victims are expected to survive. Johnson was laid off about a year ago from a company housed in the Empire State Building." With that, we suggest following WNYC's News Blog for more. If we see notable developments, we'll start a new post. A man "fired from his job a year or so ago ... killed one person and at least nine other people were shot," Mayor Michael Bloomberg just told reporters. Some of the injured may have been wounded by shots fired by police officers when they confronted the gunman, the mayor added. All nine are expected to recover. Police Commissioner Raymond Kelly identified the gunman as Jeffrey Johnson, 53 (we can't verify the spelling on Jeffrey at this point). Kelly said Johnson was armed with a handgun. The other person killed was a 41-year-old former coworker of Johnson's, Kelly said. "Two law enforcement officials say a recently fired store worker shot a former colleague to death and then randomly opened fired on others near the Empire State Building," WNYC writes. "The officials say the gunman previously worked at a store inside the landmark skyscraper." Update at 11:05 a.m. ET. Seven Wounded, "None Too Seriously," By Man In "Business Suit"? New York's Daily News says it has been told police and witnesses that the gunman, "wearing a business suit," killed one person — possibly a coworker — and then wounded seven other people "none too seriously" before being shot dead by a police officer. Mayor Michael Bloomberg is expected to brief the news media any minute now, Fox News and other outlets report. Update at 10:53 a.m. ET. 10 Shot, 2 Dead, WNYC Says. 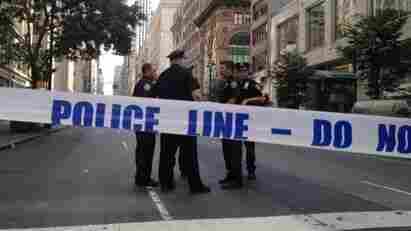 "Ten people were shot and two were killed outside the Empire State Building Friday morning, WNYC confirmed. A law enforcement official says it stemmed from workplace dispute. The official spoke on condition of anonymity because the investigation was ongoing." -- "Law enforcement officials ... say at least four people have been shot outside the Empire State Building in violence that stemmed from a workplace dispute." -- "The gunman has been killed by police." -- "Police say as many as 10 people were injured, but it is unclear how many of them were hit by bullets." And as we reported earlier, there are also multiple reports that at least one other person was killed and that officials see no connection to terrorism. New York City Fire Department officials say "paramedics are evaluating eight people but some of them may not have been shot," WNYC reports. Update at 10:25 a.m. ET. No Connection To Terrorism, Officials Say. "Two law enforcement officials said investigators have concluded that the shooting had no connection to terrorism and that it appeared to stem from a domestic dispute of some kind. A third said it may have been sparked by a robbery or dispute in the street." We've also updated our headline to reflect that multiple news outlets are now saying they've been told that two people are dead — one of them the gunman. There's now a Reddit thread called "Shooting Outside of Empire State Building 8/24/2012" on which some people are sharing what they say are first-hand reports from at or near the scene. Treat them as unverified reports, but understand that they likely include valuable information. Update at 10:10 a.m. ET. Reports: Two Dead? Eight Wounded? Work Dispute? Reuters leads its latest story with this: "Two people were killed and at least eight were wounded in a shooting outside the landmark Empire State Building in New York City on Friday, according to a New York police source. One of the dead was the shooter, the source said, adding that there was no apparent link to terrorism." The New York Post says it's been told by sources that this was "a dispute between coworkers [that] exploded into gunfire."